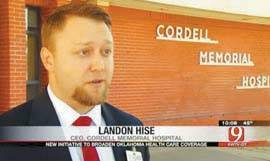 Reporter Steve Shaw with News9 in Oklahoma City came back to Cordell Memorial Hospital recently to do another story featuring CEO Landon Hise. Shaw came to the hospital clinic’s open house last April. He made this trip to Cordell to talk to Hise about his support of a plan by the Oklahoma Hospital Association to get the state to accept federal funding to expand Medicaid.